“Cartoonists work by the sweat of their hand and the work of their brow.” The Hecklers: 234. Born 1943 in Woodstock Ontario. He studied sculpture at the Ontario College of Art and later sociology at Carleton University in Ottawa. He co-founded Guerilla, a Toronto underground newspaper that ran from 1969 through 1974. As the same time, he freelanced for The Toronto Star, Saturday Night, The Financial Post, Maclean’s, Canadian Tribune and other Toronto publications. He was editor of Piranha a humour magazine. In 1977, he was one of the founders of Union Art Services, a co-operative mailing service of graphics and cartoons which went out to about forty-five labour publications. Best Canadian Political Cartoons, 1983. Ed., N.M. Stahl. For., David Rosen. McClelland & Stewart Ltd. Sept. 1983. Best Canadian Political Cartoons, 1984. Ed., N.M. Stahl. For.,Robert LaPalme. McClelland & Stewart Ltd. Sept. 1984. Portfoolio 13: The Year’s Best Canadian Editorial Cartoons. Ed., Guy Badeaux . 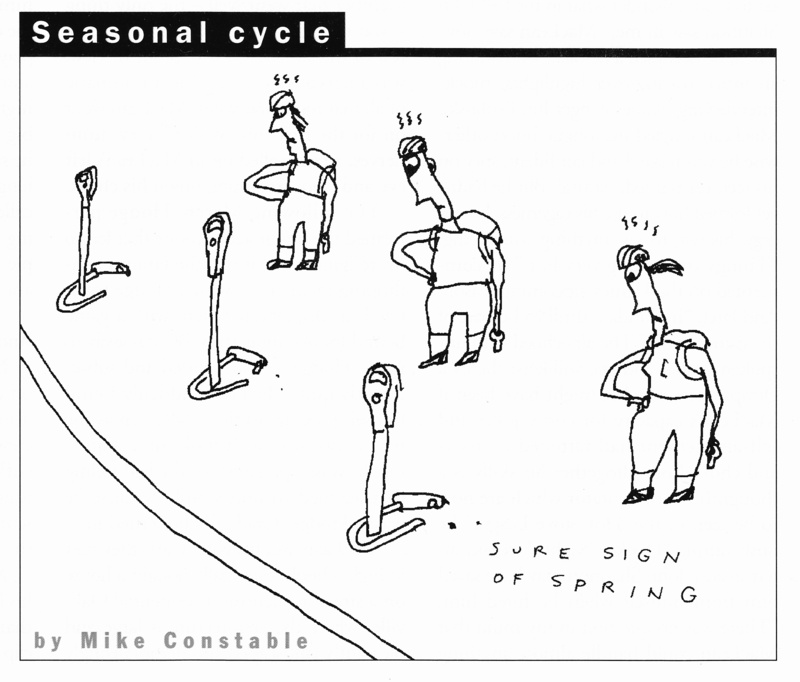 Writ., Jay Stone Macmillan of Canada, 1997..
“Mike Constable.” Portfoolio, The Year 85 In Canadian Caricature. Ed., Guy Badeaux & Alan King. Writ., Charles Gordon. Ludcom Inc. 1985: 199. “ Mike Constable.” Portfoolio 14: The Year’s Best Canadian Editorial Cartoons. Ed., Guy Badeaux. Writ., Jay Stone Macmillan of Canada, 1998: 144.. The Hecklers. Writ. & Ed.., Peter Desbarates & Terry Mosher. McClelland & Stewart Ltd., 1979: 233-234. Saturday Night, April 1996, 100.